I’ve just come back from my third visit to Cambodia, and each time I expect to write about it. I’m no qualified scholar of Cambodian history, but I spent a short time working with Cambodian refugees in Hartford and two months researching the Extraordinary Chambers, or ECCC, the war crimes tribunal created to adjudicate the crimes of the Khmer Rouge. In August 2017, I visited the Tuol Sleng Genocide Museum in Phnom Penh, where I filled in the mental scaffolding I’d established by standing outside of empty torture rooms and running my eyes over thousands and thousands and thousands of names, knowing they would vanish from my memory. 15,000 people were imprisoned and killed at Tuol Sleng, which had once been a high school. I lit incense in a somber memorial room at the end that is filled with skulls. Sometimes it seems that the cruelties of history are mostly remembered through their persistent pain, despite our best efforts to know them through redemption. “What do you think of Cambodian politics?” asked my tuk tuk driver today, on the way to the airport. “…What do you think?” I replied carefully. 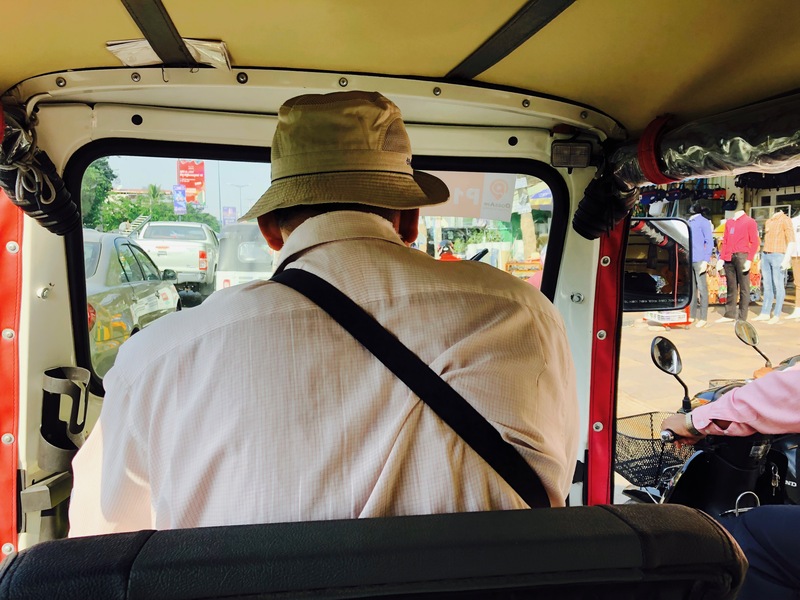 Motorbikes and trucks and cars and luxury sedans jockeyed for space on the highway, pressing in on the open sides of our tuk-tuk, where I had my leg through the strap of my bag after twice having items snatched off of me by passing motorists. It seems hard to argue that not much has changed. When Phnom Penh was reclaimed from the Khmer Rouge in 1979 after four years of destruction and enslavement, the rubbled city no longer had electricity or plumbing or safe water or schools or working telephones; the use of money had been abolished. Nearly a quarter of the Cambodian population and most of the educated class had been slaughtered. There were at total of seven lawyers left in the whole country to rebuild the government. Working off my not-particularly-relevant experience of what it’s like trying to develop infrastructure in Nepal, I find it absolutely astounding what Cambodia has rebuilt in just four decades, albeit under an authoritarian regime. I guessed my tuk-tuk driver to be in his early fifties, old enough to have been alive during the genocide. I wondered what he wanted to tell me about. “Where were you during the war?” I asked. I learned that the driver had one sister and five brothers, and I wanted to ask how they had fared, but didn’t know if I should. Many children whose stories started this way lost their entire families under the Khmer Rouge, sometimes before their eyes. “What do you think is the biggest problem for Cambodia now?” I asked instead. “Education,” the driver stated firmly. I learned that he had been able to pick up his studies again in 1982. That Cambodia has struggled to rebuild its education system is no wonder. In 1979, there were so few intellectuals left alive that a former math teacher, Chan Ven, was put in charge of rebuilding the Ministry of Education. The three-decade old United Nations, with its dominant American, British and Chinese powers, opposed the new Cambodian government because it was backed by the Vietnamese. So after receiving more American bombs on its soil during the Vietnam war than Japan received during World War II–an act that won Henry Kissinger the Nobel Peace Prize–a traumatized Cambodian populace was left to prosecute war crimes, reconstruct the government, and reestablish basic institutions without the help of international human rights bodies. During the Cold War, the Hun Sen military regime that liberated Cambodia from the Khmer Rouge was systematically and repeatedly denied U.N. support, which was deferred instead to the Khmer Rouge in exile. To this day, the regime continues to run the government and suppress opposition. Last Saturday, a bunch of us took a long ride out to see the new Win-Win monument. The tower was recently built to commemorate the end of civil war in Cambodia in 1998, when outlying factions of the Khmer Rouge finally entered in to an agreement with the Hun Sen government, bringing about the end of decades of violence. The monument is built of intricately carved sandstone and polished granite, and in many places is still under construction even while throngs of mostly Cambodian visitors visit each day. 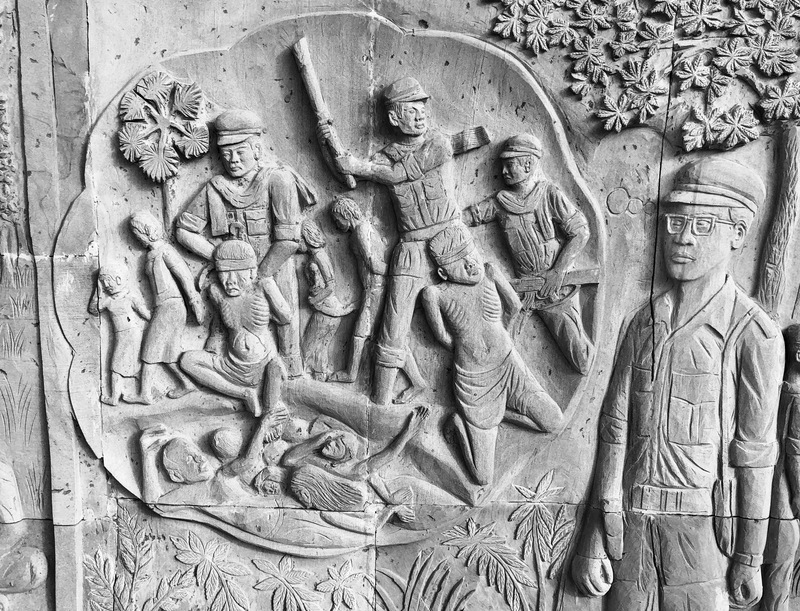 What most caught our attention, though, was a lengthy retelling of Cambodian history carved in to stone panels around the base of the monument. It starts before the genocide and continues for probably a quarter mile or more. 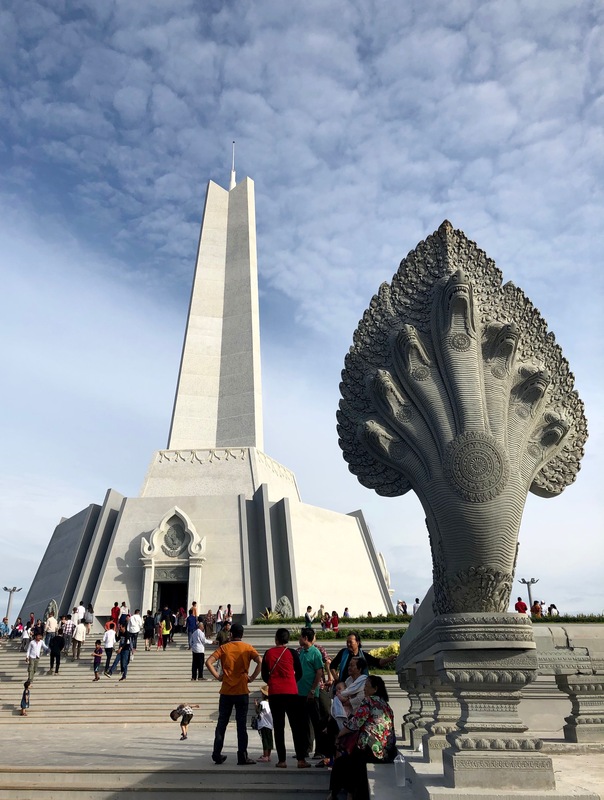 The story is portrayed with a nationalistic fervor that is not subtle, and the monument also sits across the way from a large athletic complex being built for the 2020 ASEAN Games. It is clearly a display of political pride and might. One might say unvarnished propaganda. On the ride home, we found ourselves talking about the importance of uniting narratives in national identity. But before we left, we trod through the entire narrative display panel by panel by panel, slowly watching sun change its shadows on the carved faces. One, near the beginning, captivated me for some time. It’s intimate brutalities are historically accurate. “They sound very smart,” I replied. At the time, I assumed he was worried about affording his sons’ education, or about whether they would be successful in their pursuits, and maybe that is he that is what he meant. But it occurred to me later that, maybe not. We arrived at the airport, and the driver dropped me off, and rode back in to the traffic.